Adult virtual reality game New Wife: Lovely X Cation let's you marry the object of your misplaced affection. Gamers already are frustratingly stereotyped as socially awkward guys quarantined in their mother's basement with no life, no girlfriend and no concept of social graces. Even more frustrating is when video game companies pander to that stereotype, such as the new adult game New Wife: Lovely X Cation from Hibiki Works. 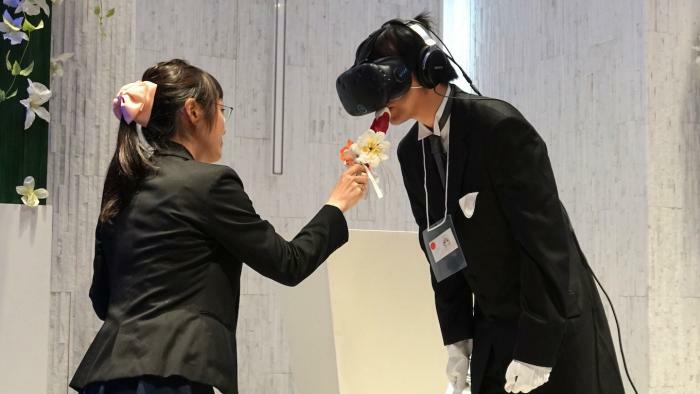 In an awkward publicity stunt, the company held a virtual wedding where the winner of a contest got to marry an anime character in the game. The groom, virtually resplendent in a tux, white gloves and matching headset and headphones, was likely waiting impatiently, possibly even fidgeting a bit as the virtual preacher consecrated and blessed the faux religious union. When all was said and done, the groom leaned in to kiss his new bride, planting one firmly on her marshmallow. To be clear, the marshmallow does not come with the game and will require a friend to hold it in place for you, while probably silently mocking your lack of a life. There are several photos up on VR site Panora. There are likely only two ways this plays out for the "groom." The poor "winner" will likely become meme fodder and an internet celebrity, albeit only in the object of derision sense. The other way is that he forgets this incident ever happened, being eternally grateful that the non-binding ceremony won't end in a messy divorce and him paying needless alimony to the game company. There are unsubstantiated rumors that Hibiki Games has two sequels in the works: My Wife: The Honeymoon and My Wife and the Baby. "There are unsubstantiated rumors that Hibiki Games has two sequels in the works: My Wife: The Honeymoon and My Wife and the Baby. "